I’m one of those I’m-not-sure-if-it’s-cooked-enough-I’ll-just-cook-it-a-few-more-minutes-to-be-sure people. That means I pretty much always overcook the stuff that you shouldn’t overcook; mainly, it’s fish. 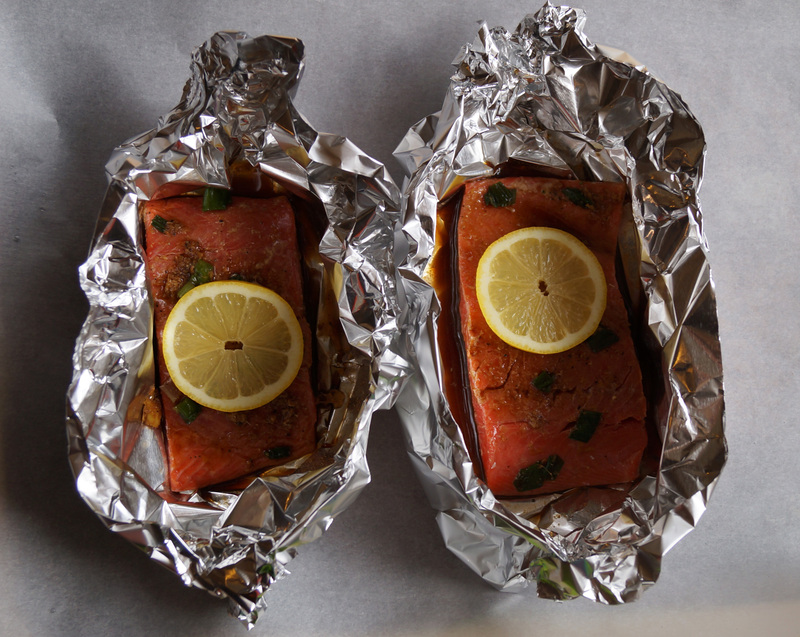 Foil wrapping and baking is my favorite way to cook fish now, since it gives you lots of leeway. It seems to always stay moist and soft pretty much no matter what type of fish I use or whether I leave it in the oven a little extra time. I’m also known to show up at a BBQ in the summer with a packet of my own fish ready to put on the grill. That way, I have something to eat since I’m not really a fan of hot dogs. Give this a whirl. In a small bowl, whisk together the oil, lemon juice, zest, ginger, soy sauce, onions, salt, and pepper. Lay out two sheets of tin foil and place one fillet of fish on each. Pull the sides of the foil up and roll the ends together. 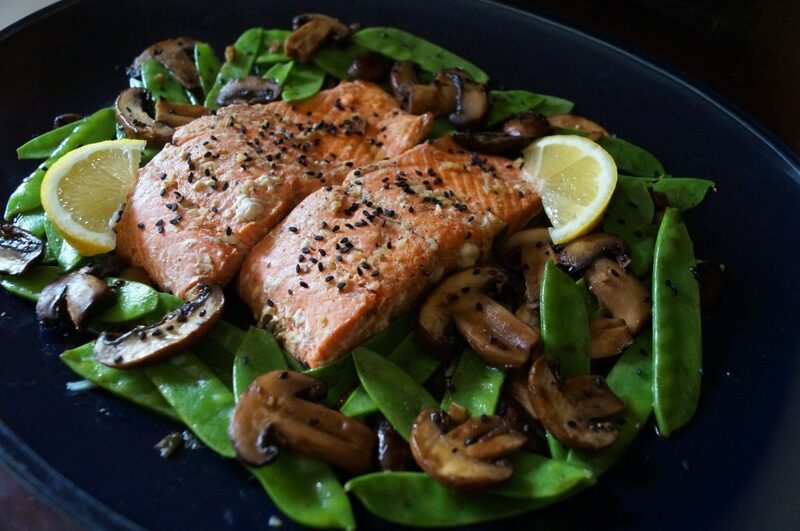 I like to let the fish marinate right in the foil packets – why dirty another dish if you don’t have to? Pour half of the marinade mixture onto each fish coating the top & bottom, close the foil’s top and sides fully, and let it marinate for about an hour. Preheat the oven to 375. Put the fish packets on a cookie sheet and bake for about 20-25 minutes, depending on the thickness of your fish. Open the foil and garnish with sesame seeds and extra lemon. Slice mushrooms and chop garlic finely. Sautee the mushrooms and garlic over medium heat. I learned my lesson from Julia & Julia: “Don’t crowd the mushrooms!” Choose a larger sautee pan if you have one. 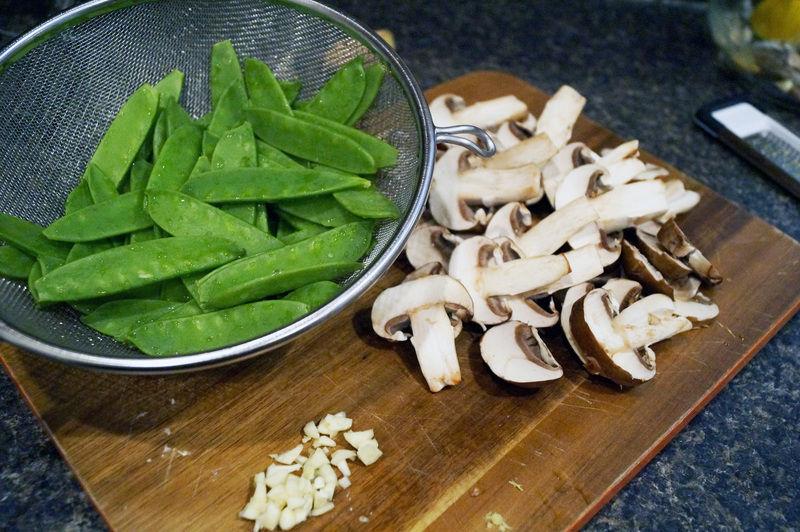 Once the mushrooms are browned, add the snap peas and soy sauce, stir, lower the heat, and cover. Let the peas steam for a few minutes. I like it when they still have a crunch to them, so I let them cook for about 4 minutes. Take a bite to test them and cook to your liking. Season with salt and pepper and enjoy!